Invisalign clear aligners have several advantages over traditional braces. First, they’re removable, which means you can easily take them off to eat or brush your teeth. This can save you from many of the difficulties and dietary restrictions that come with traditional braces. You don’t have to worry about decay happening between the metal wires and you can keep your hygiene without having to constantly clean between the metal brackets. Second, Invisalign clear aligners are virtually invisible, which means most people won’t even know you’re wearing them. They’re also quite comfortable to wear and do not frequently lead to the dull pain some patients experience with traditional braces. On a related note, visits to the dentist are fast and painless with Invisalign clear aligners. No more wire tightening or invasive adjustments — just quick check-ins. It’s no secret that braces aren’t very much fun — just ask any kid or teenager who has them. If you happen to be an adult in need of braces, the downsides are often harder to deal with. After all, who wants a mouth full a metal for several months or years of their life? While traditional braces are effective at straightening teeth and fixing other structural problems, they can also be quite uncomfortable, difficult to eat with, and (depending on who you ask) unsightly. For these reasons, many adults in need of orthodontic care shy away from traditional braces. 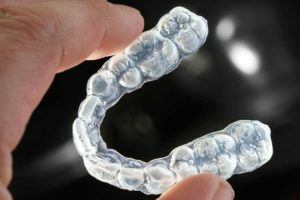 Now, there is an alternative, Invisalign clear aligners are totally transparent and removable teeth-straightening trays that fit over the teeth like a mouthguard to move them slowly over time. Comfortable, removable, and virtually invisible, Invisalign clear aligners are today’s orthodontic appliance of choice for most adults in need of orthodontic care. At Euclid Dental Center, we are proud to offer Invisalign clear aligners to adult patients in Ontario, CA and the surround region. Read on learn more, and contact our dental office at (909) 391-4300 to schedule a consultation today! Invisalign clear aligners are a type of orthodontic treatment used on children, teens and adults to correct mild to moderate alignment issues of the teeth. Unlike traditional braces, which use bonded brackets and metal wires to slowly pull the teeth into place, Invisalign clear aligners sit over the teeth to straighten them incrementally over time. This process is completed using 3D images of your teeth obtained from molds. These 3D images are uploaded onto a computer and manipulated strategically by an orthodontist. Each manipulation is step closer to a perfectly straight set of teeth and is printed and worn as an Invisalign clear aligner for several weeks until movement is complete and the next tray is needed. Invisalign clear aligners are made of plastic and resemble very thin, transparent mouth guards.